The Single Rib stitch is a deep texture that makes a beautiful brim on a hat and can be worked top down or bottom up. It also make a wonderful thick blanket texture. This stitch has a wonderful amount of stretch that helps it when used for a hat brim. The single rib stitch is very easy to do if you know how to front and back post crochet. The only thing to be aware of is that the width of your work will shrink up quite a bit from your first row worked. I will show you this in both the photo and video tutorials. This is one of the crochet stitches we are learning and using during the March Texture Madness Crochet A Long and I will provide you instructions to make a sample swatch of the Waffle stitch below in 3 different sizes. These swatch patterns can be used to make any of the three project patterns created by the Crochet A Long. You can learn more about Front Post and Back Post Stitches here. When working the Single Rib Stitch you will want to any even number of chains. Please note that I do not count my turning chain as a stitch. For the Large (Blanket) 12 inch Swatch we will chain 52. For the Medium (Book) 8 inch Swatch we will chain 30. For the Small (Block) 4 inch swatch we will chain 20. Please note, if you use an ad blocker you may need to turn off the ad blocker to see the videos. R1: Dc in the third Ch from the hook and ever Ch across. R2: Ch2, turn, Dc in the first stitch, *FpDc in the next stitch, BpDc in the next stitch* repeat from *to* until the last stitch, Dc in the last stitch. To continue working this stitch, simply repeat Rows 2 until your project is as long as you would like it to be. After working 4 rows of just 10 stitches, my sample shark about half an inch. To make a 12 inch square work until you have a total of 30 rows. To make a 8 inch square work until you have a total of 17 rows. To make a 4 inch square work until you have a total of 11 rows. With this stitch it is a little hard to count the rows. I recommend you keep working the stitch until your piece simply reaches the measurement you are trying to achieve. 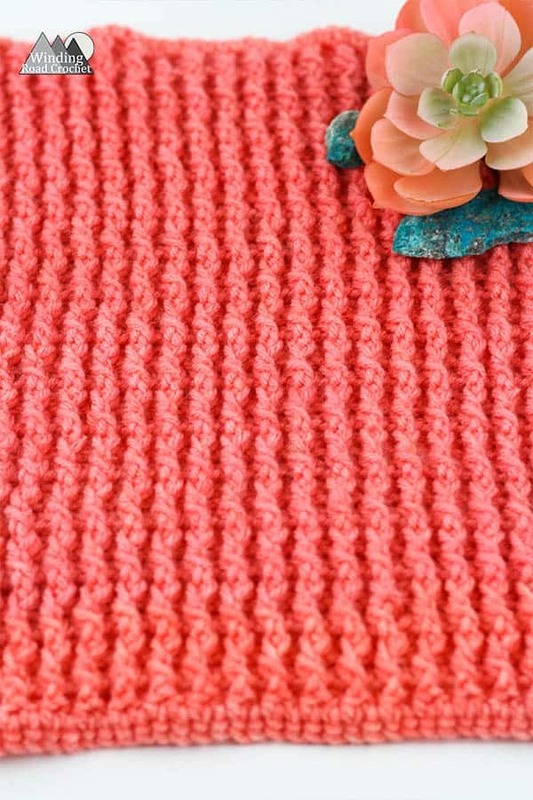 For all three projects for the March Texture Madness Crochet A Long, it is helpful to have a single crochet border around the edge of your sample. With this stitch I found it easiest to work one single crochet into each stitch on the top and bottom rows. For the sides of the sample swatch I alternated working 2 Single crochet into the side of a Double crochet in one row, and only 1 Single Crochet into the side of the Double Crochet of the next row. This help compensate for the slightly shorter stitches caused by the Front Post Double Crochet. I hope you liked this stitch tutorial. Make sure you check back in a few days for the next Stitch Tutorial of the March Texture Madness Crochet A Long. Written pattern, tutorials, graphs and pdfs of the Single Rib Stitch Tutorial are copyright Windingroadcrochet.com. Please do not reprint or repost this content as your own, but please feel free to share this link with others. You can find more information on sharing my work with others in the Terms and Conditions Page.